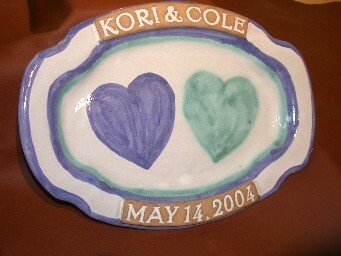 This platter is great for weddings, anniversaries, awards, and much more. Just let us know what name or names, date or dates, Happy Birthday, Happy anniversary, Merry Christmas, or whatever you want to say. On the plate's middle, we will put hearts, bluebonnets, nothing, cows, horses, or any of the other designs we have for you to choose from. This is made from stoneware clay and is high fired so you can use it everyday.